Brewing is easy. If you can make mac and cheese from a box without help, you can make beer. NOTE: This is a basic overview for brewing an extract recipe. To learn about all-grain brewing, click here. If gathering all of that sounds like too much work, simply choose a beer making kit that has everything you need to brew, all in one box. 2. Sanitize, Sanitize, Sanitize. Your success will rely on how clean your equipment is. Anything that comes in contact with your beer after the boil process should be sanitized. PBW and Star San are great santizers. Read more about preparing to brew. 1. Steep Grains. Fill your 5-gallon brew kettle with 2.5 gallons of water. As you heat your water, steep your grains for 20 minutes, or until your water reaches 170 degrees. When you remove your grains, let the water drip out of the grain bag and into the kettle. Don't squeeze your grain bag as you don't want to extract tannins, which may give your beer unwanted flavors. 2. Bring kettle to a boil, remove from heat, and add malt extracts. Be careful not to boil over. Hops are added at various intervals. Refer to your exact recipe as to when you need to add hops to your boil. Set your pot in a sink filled with ice water. Use a wort chiller: Insert chiller into your wort. Run cold water from your tap through the chiller and out to the sink. A wort chiller is the most effective way, but either will get you the desired results. 1. Pour cooled wort into fermenter. Some pots even have a valve for easy transportation from your kettle to your fermenter. 2. Add water to bring the level to 5 gallons. 3. Aerate wort by splashing it around in its container. Yeast need oxygen, and splashing your wort will help. 4. Add yeast. Dry yeast is the easiest, as you don't have to prepare it beforehand. Sanitize the yeast pack + scissors, cut the corner off the yeast pack, and pour the yeast into the fermenter. 5. Seal your fermenter, add an air lock, and store in a dark, cool place. Ales should stay at 68 degrees to ferment properly. 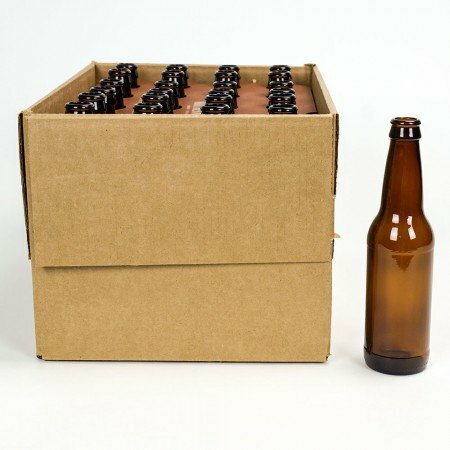 After fermentation is complete, typically within two weeks, it's time to bottle your beer. 1. Cleanse everything: bottles, bottle filler, bottle caps, bottling bucket, and any transfer hoses used. Use a bottle brush on your bottles. 3. Boil your priming sugar in 16 oz of water. After it cools, add it directly to the bottling bucket. 4. Transfer your beer. Siphon the beer out of your fermenter and into your bottling bucket. Leave as much sediment in the fermenter as possible. 5. Fill the bottles. Attach bottle filler to hose, and hose to bottling bucket spigot. Open the bottling bucket spigot and push the bottle filler to the bottom of the bottle. NOTE: Fill each bottle right to the top. When you remove the bottle filler, it will leave the perfect amount of space at the top of the bottle. 6. Cap the bottles with caps and a capper. 7. Store the bottles at room temperature for roughly two weeks. This gives your beer time to carbonate. You did it. You made beer. All that's left to do is..
We're here 7 days/week, so Contact Us with any questions you have about brewing!